Marvel and Disney have an interesting situation on their hands. The Marvel Cinematic Universe is widely popular, and in 2008, Samuel L. Jackson began to firmly establish himself as Nick Fury in Iron Man. Anyone who has only been exposed to this second level Marvel character, on the big screen, can only visualize Fury as Jackson. So for those who explore comics because they enjoyed the Avenger Initiative may be surprised when the stumble upon Fury in print. Yes, Nick Fury in the Ultimate Universe is stylized to look like Jackson, but in the mainline Marvel Universe, Earth 616, super spy Nick Fury is a gruff Caucasian man. In this universe Fury is more along the lines of Clint Eastwood than Samuel L. Jackson. And though this is a comic universe where things can be changed with a brush stroke and a few lines of story, his ethnicity is a little harder to change since Fury has been Caucasian since 1963. So how does one reconcile Marvel history with the expectations of fans who have only seen the movies? I believe Marvel thinks they have found their solution in Secret Avengers. With issue 1 in February 2013, Secret Avengers caught my attention for two reasons. First, it advertised that Agent Phil Coulson was featured. Agent Coulson is a model for all agents! Second, it would feature an African-American Nick Fury. The full cast of the title includes S.H.I.E.L.D. agent Maria Hill, Hawkeye and Black Widow. With 4 members of The Avengers cast, this title is clearly reaching out to fans of the movies. And then adding an African-American Nick Fury completes the attempt to bring movie audiences to a print title. And honestly, though Avengers is in the title, this really is a S.H.I.E.L.D. book. And being a S.H.I.E.L.D. 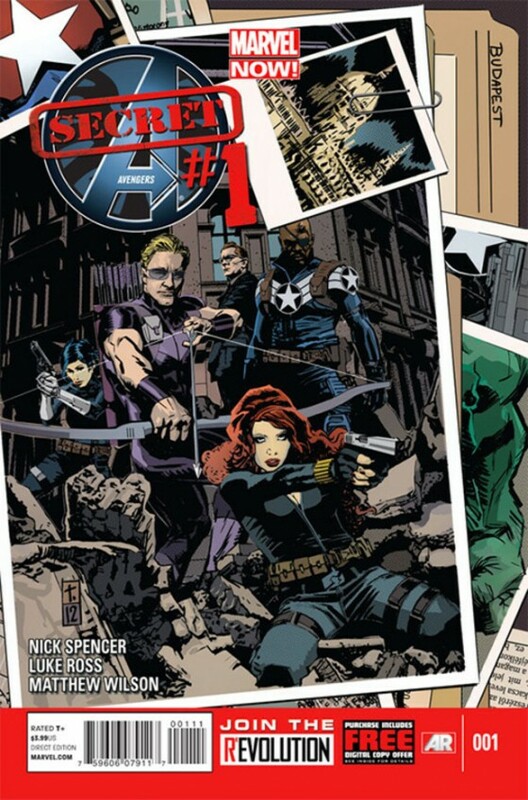 book it can help fill the time for fans awaiting the premiere of Marvel’s Agents of S.H.I.E.L.D..
As the story opens in Secret Avengers #1, Hawkeye is being taken captive in a foreign land, on a mission that Hawkeye has no knowledge of, in an undisclosed location. This leads to a series of flashbacks where Agent Coulson recruits Hawkeye and Black Widow to serve as Black Ops agents for S.H.I.E.L.D. The duo is introduced to their new field commander, an African-American Nick Fury dressed in a Captain America inspired uniform. The team hits the ground attempting to capture a dealer in black magic before his skills can be used to strike a vital title in the United States. Throughout the book we learn there are secrets upon secrets ranging from why Hawkeye and Black Widow took this assignment to what S.H.I.E.L.D.’s full motivation for using these former Avengers. The story provides hints to action that could happen in future issues and the secrets that can be revealed but the main story is fully resolved in this introductory issue. Secret Avengers is part of the Marvel NOW! reboot, restructure, reset, or whatever “re” word you want to use. Basically this is a good opportunity to reconcile the print and the cinematic world. And since other changes are occurring, now is the time to bring an African-American Nick Fury into Marvel mainstream with the least disruption. Of course it is because of Agent Fury and Agent Coulson that I laid out petty cash for this training manual. This young and new Agent Nick Fury is modeled after Jackson. He also is a character with unclear motives, much like the movie version. The biggest difference is this Fury is fighting and leading in the field while the Jackson version is largely directing from the bridge of the Helicarrier. I do have a lot of questions about this Agent Fury. It appears that I can find answers to some of these questions in a title called Battle Scars which concluded before Secret Avengers. That series also introduces Agent Coulson to the Marvel mainline universe. I have to admit that I did really enjoy Hawkeye’s reaction to this new Agent Nick Fury! He and Fury discuss if the name Nick Fury and James Bond are actually code names for agents and not specific people. It was humorous to watch a Marvel character attempt to reconcile Bond canon which is far from as complicated as Marvel fictional history. I must admit that I have not warmed up to this version of Agent Coulson. I have seen an animated version of Agent Coulson in Ultimate Spider-Man which is part comic relief straight man and part action hero. This Agent Coulson in this single issue is, well, a used car salesman. I feel like the Agent Coulson in the Marvel Cinematic Universe is a straight up guy. This guy on the other hand feels a little slimy as he plays let’s make a deal. The graphics are, in my opinion, solid in this issue. They really help set the stage for a tale that it more spy story than superhero epic. The settings are dark and filled with the back alley type settings you would expect from a black ops team. Sadly, unless the images are super cutting edge, I really do not take full notice of them until they are distracting from the story. 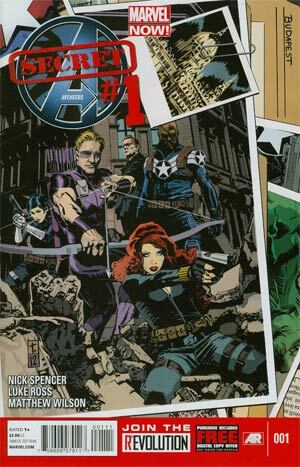 From the business side, I can see why Marvel and Disney both want Secret Avengers. In this title, Marvel brings the movies and Marvel tradition together in a way that could bring new readers to print, paper or digital. 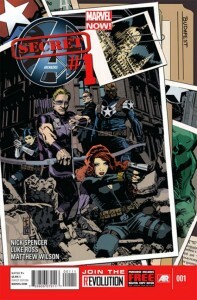 I found Secret Avengers #1 a solid endeavor. And my original belief was I would not follow this title except in borrowed trade collections. However, with the announcement of Marvel’s Agents of S.H.I.E.L.D this title is the current go to for fans who need their Agent Coulson fix before fall. My wife and I are Coulson fans, too, so I really appreciate your reviews of ALL current Secret Avengers graphic novel collections and new comix series, so I won’t waste my money. Based on your reviews, #1 and #2 of the graphic novel collections are worthwhile for Coulson fans. Won’t bother buying the new comic series at all (up to #4 now) until they improve the storyline with Coulson. WIll stay tuned. Many thanks. That’s why we are here…to protect good old AC!